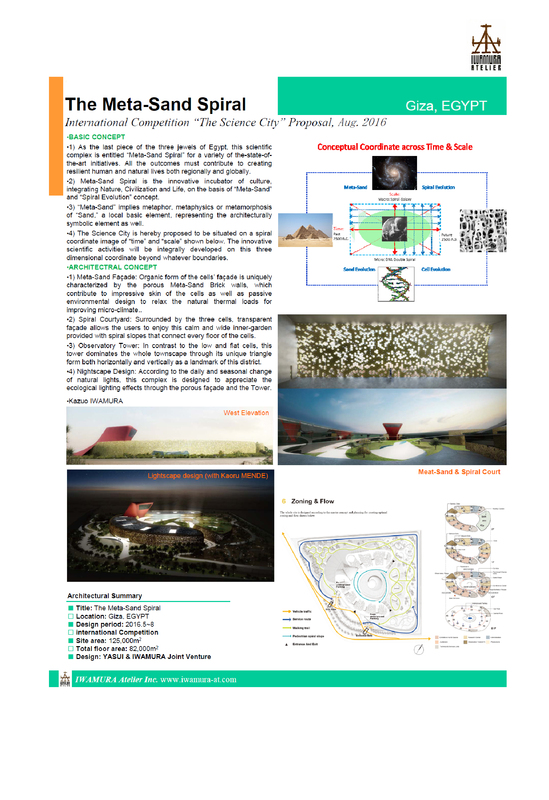 Urban Planning & Design – Iwamura Atelier Inc.
Meta Sand Spiral (International Competition）JV with Yasui Sekkei Inc. This is a residential area of detached houses developed as a part of large scale new town “Lake Town.” Cooperated with the developer (Daiwa House Industry Co.), IA elaborated the urban layout as a model of Environmentally Symbiotic Housing. This is the counter project of a local organization against the proposal of large shopping center on the site of Japan Tabaco factory. 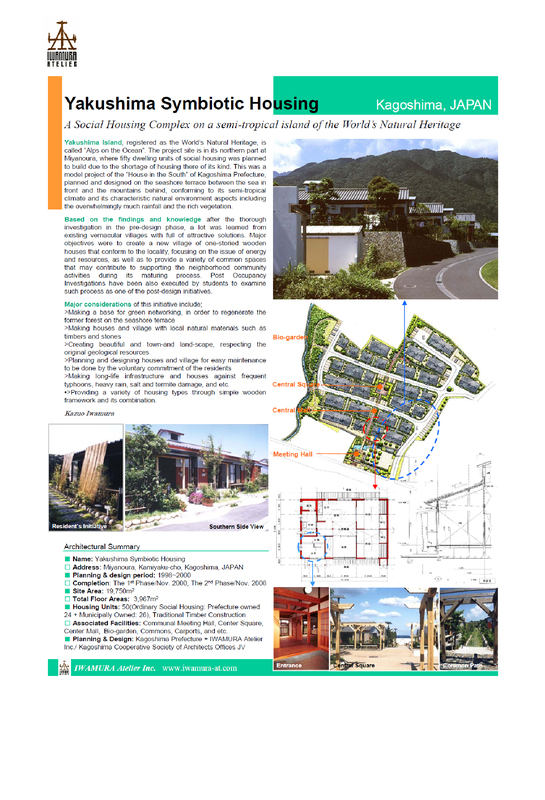 IA made efforts of conducting a variety of investigations and proposing an environmentally symbiotic urban renewal, which drew large and wide attentions in Matsuyama. 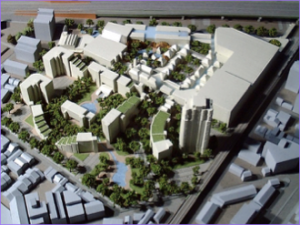 Concept making investigation has been conducted for the large shopping center to be built on the site of railway station as the urban renewal project in Koto-ku. The regional context was minutely analyzed in order to compile the project priority for environmentally symbiotic urban refevelopment. This is the research work on the possibility of urban renewal by means of distributed energy supply system in terms of a sustainable development. It was conducted in collaboration with OOOKA Lab. of the University of Tokyo and the outcome was presented at the international conference SB05 and etc. As the consultant of a large scale urban renewal, IA conducted the detailed research and analysis of the district environment and compiled the cyclical town planning guidelines. During the execution phase, IA played the role of evaluating and supervising the respective projects including SC, Condominiums, Institutes, Offices etc. This is a newly opened housing exhibition park according to the environmentally symbiotic housing concept. IWAMURA Atelier was assigned to design the whole layout plan as well as the Center House. Under the name of Agricultural Village, a variety of wooden facilities and activities regarding the art and food culture are provided to be able to experience the local industry, techniques, skills and traditional culture based on the local agriculture. IA elaborated not only the architectural design but also the related programs. Based on the redevelopment plan of “Ryugasaki Newtown,” IA elaborated the whole design of this detached house residential block according to the environmentally symbiotic housing concept. It was exhibited as the model housing development before being sold. According to the redevelopment plan of the whole Newtown, IWAMURA Atelier elaborated this 23rd Block for detached houses. This high-rise condominium complex has been designed as a town renewal project, subsidized by the national and local government. From the very beginning, IWAMURA Atelier helped organize the land owners organization as well as the brain network to implement this complex project incorporating the memories of the place. As the main gate of Sendai City, a renewal proposal for the railway station’s place has been elaborated in collaboration with Kaoru MENDE and Kazuko FUJIE. 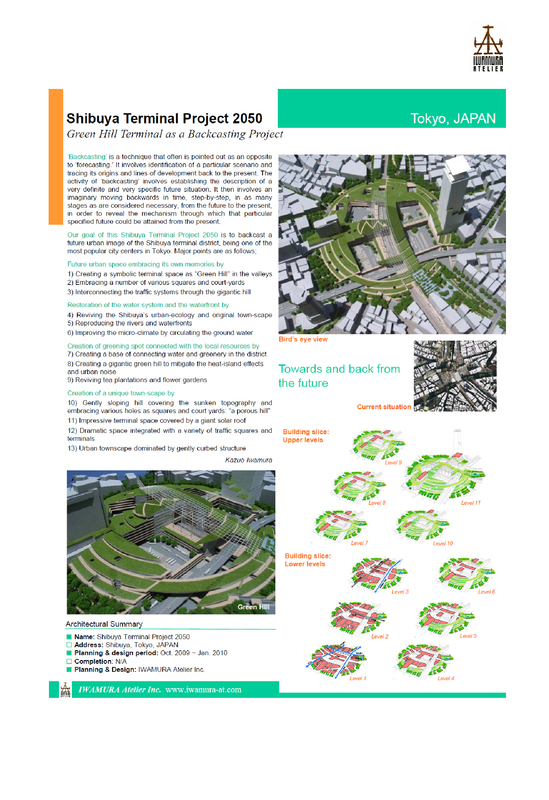 As the main urban axis of Sendai City, a total renewal of the AOBA Avenue has been proposed in terms of sound, color, greenery, street furniture etc., in collaboration with top designers in each expertise. Governor HIRAMATSU came up with the policy of “Amenity Town Plan” in preparation for the population decrease and assigned Arata ISOZAKI and Kei MINOHARA to organize and supervise a team of architects including IWAMURA, KURYU and ARAI who took care of 3 representative local towns respectively. IWAMURA Atelier was assigned to elaborate a cooperative business park design in the South of Sapporo City in view of creating there a research & development center of Industry, Art and Environment, which was completed in Mar. 1993. As a part of consultant group, IWAMURA Aetlier elaborated a variety of researches to contribute for designing this urban renewal project, including the commercial facilities associated with the municipal cultural center for women. This was then the largest urban development area in Japan covered by the municipal district planning system. IWAMURA Atelier was assigned to compile the guidelines of this system. An old and deteriorated shopping mall was planned to be replaced by a shopping center, the preliminary design of which was elaborated by IWAMURA Atelier.